Death Waltz has been teasing an upcoming Halloween soundtrack release for the last few weeks, and today they made the official announcement the original soundtracks by Alan Howarth for Halloween 4: The Return of Michael Myers and Halloween 5: The Revenge of Michael Myers are coming to vinyl this week, and that’s not all, as it was also revealed that the first three films in the franchise will follow. From the official announcement made on Instagram today: To celebrate 40 years of the Halloween franchise, Death Waltz Recording Company is thrilled to bring you a newly re-mastered version of the score to Halloween 4: The Return of Michael Myers on vinyl for the first time in 30 years, mastered in 2018 by Alan Howarth. This score marked the first time Howarth was working solo within the Halloween franchise and he takes the blueprint he and John Carpenter created, but weaves new themes for both Jamie Lloyd and Michael within the familiar framework of the 5/4 theme timing. Art for this release (pictured below) is by Gary Pulllin. Halloween 5: The Revenge of Michael Myers has again been freshly re-mastered by composer Alan Howarth for this first vinyl re-issue in 30 years. He once again takes the familiar Halloween blueprint but expands it greatly utilizing layers of synths to create a fresh take on something that is familiar to all fans of the franchise. Art for this release (pictured below) is by Randy Ortiz. The Halloween 4 and 5 soundtracks will be available starting this Wednesday, July 25. Both are available separately but you can also buy the Halloween Bundle that includes both releases plus a free slipcase, featuring artwork by Mike Saputo that all five(!) Halloween releases from Death Waltz will sit in. Halloween III: Season of the Witch – Music by John Carpenter and Alan Howarth, with original artwork and design by Alan Hynes, available this August. Halloween II – Music by John Carpenter in association with Alan Howarth, with original artwork by Paul Mann, available this September. Halloween – Music by John Carpenter, with original artwork by Mike Saputo, available this October. 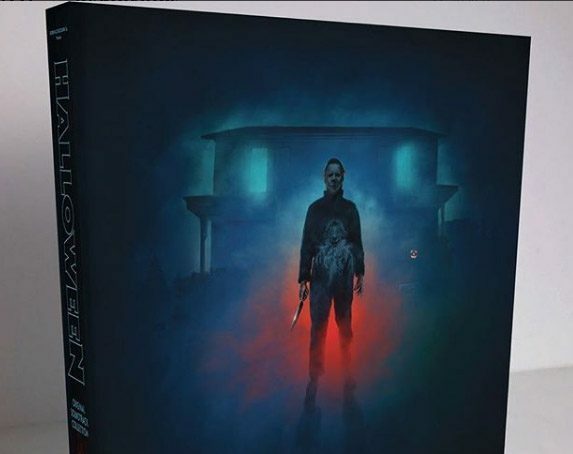 You can see previews of the new cover art for the Halloween 4 and 5 vinyl releases below.